Loved seeing all the work and craftsmanship that goes into one of these. And Zada most have some muscular arms (all the camera-holding)…. Zada was so nice to shoot stills and video of the process. I wanted to include her in photos whenever I could because we all know how much work must be done when your Significant Other is solely dedicated to their art. In my case, it wasn’t ‘art’, but it was printing deadlines. I worked 16 hour days for years, because my wife did everything else. I realize that now as I’m halfway retired and have started helping her out. Nice, so much attention to natural detail. Wish we all could do this. Hal got his swarm…so I can mention his log hive now. Words fail me on how beautiful that is and a wonderful video compilation really shows the amount of work that has gone into it. Just hope you get a lovely swarm move in and looking forward to seeing that. Thanks for taking the time it’s a real highlight of the season. Thanks so much for your kind words, Thomas. As a wood craftsman yourself, you know how much work it takes to make something like this. My part of it was the crude hollowing out. I have no creative skills to brag about. I do love shooting photos and videos, but truth be known, I have a difficult time even sketching a cardboard box. I shot some video of my other two log hives yesterday…it’s a sort of video walk-through speculating which of the other two log hives will swarm first. Both of them have good traffic at the entrance, but recently I have seen drones come out of Bee Beard. I just heard a podcast about the importance of drones. They carry the genetics of the queen mother with the 16 chromosomes they get. Did I get that right? I hope so. Anyway, I’d certainly be okay with a swarm from either of the two other log hives going into the Grand Kid log hive. I’ve so enjoyed following the progress of this hive! Love, love, love it! 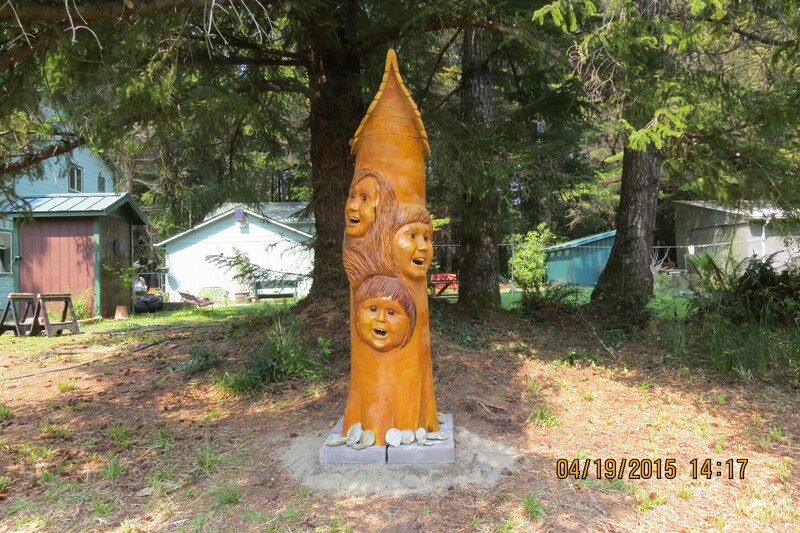 What a phenomenal job your woodcarver did! Hope you get a swarm in it soon! Brian Vorwaller is such a talented artist. I am so happy with the results of his work. The sculptures are very close in resemblance to the kids, and they look so animated. 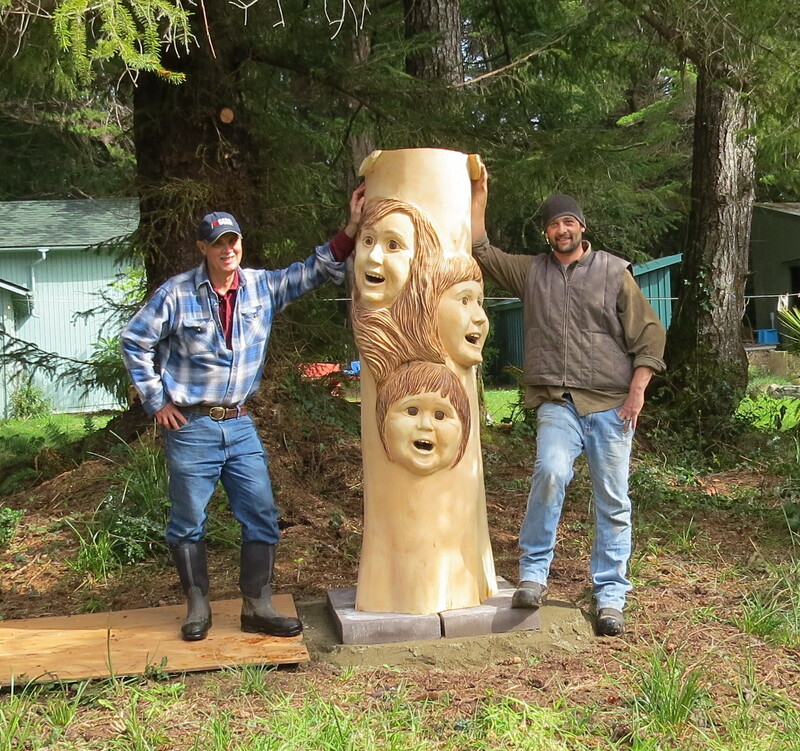 When he was done setting up the hive at my place, he said now Zada wants him to sculpt their two kids on a log. Such a marvelous composition, showing all the prep work, the artistry, the natural science and love that has already gone into this beautiful log hive! I look forward to hearing the bees have taken up residence! Thanks for chronicling this, I have enjoyed it so much! Thanks, Chakramandalas, it’s been a fun winter time project. Now it’s the waiting time which might prove to be more difficult. Every sunny day, we’re thinking, “Is this the day the swarms are going to start?” Rain tomorrow, then 5-6 days of sun…it’s gotta start then! An inspiring work of art soon to provide a home for bees! Welllll…It’s not officially a hive yet. I’ve got to entice a swarm to locate into it. The trouble is, I haven’t had a single swarm yet. By this time last year I had had about 4 or 5 swarms. I’m still waiting…waiting and hoping. I have complete confidence that sooner or later those bees will come & set up housekeeping! So much intricate planning and work involved, beautiful results. Surely some bees will want to make it their home soon. I hope to have news soon. There are bees checking out the three entrances right now. Is it because of the warm sun heating up the little bit of honeycomb and the bees picking up the smell? I don’t know, but we will soon find out. False alarm. I think the bees were just smelling the little honeycomb that had warmed up in the sun. I talked to my log hive mentor yesterday evening. Hal said he had bees rob out the frame and a half of honeycomb he put in his #4 log hive. Then 2-3 weeks went by and a big swarm moved in yesterday. I’ll be posting that when I can get his video and offer my congratulations on his hive. It’s interesting because ANYONE CAN MAKE IT! After realizing he wasn’t going to get a suitable log, he built one out of 1 x 12″ lumber.